In addition, there should be slip resistant soles to help avoid the risk of slipping on slippery surfaces. Let’s have closer look at the types of safety boots out there and what would be right for the job you need to do. Being on your feet all day, in sometimes challenging conditions and on uneven surfaces, can lead to aches and pains in your feet and ankles, with the additional risk of ankle twists and sprains . With boots providing a good level of ankle support, you will benefit from greater stability on uneven or slippery surfaces, as well as, protection against knocks and bumps to your ankle bone. What are all weather boots? As we all know, the British weather has no respect for deadlines, so when you find yourself on site in driving rain or falling snow, it’s essential to have the right gear for the job to ensure your comfort. In these types of conditions it’s worth considering water resistant or waterproof footwear. Look out for safety ratings that contain the letter combinations of WRU (water resistant uppers) and WR (water resistant footwear). Be careful of footwear claiming to be waterproof as more often than not it won’t be. To be fully waterproof you need to ensure there is a waterproof ‘membrane’ or lining within the product such as Gore-Tex or equivalents. For particularly cold conditions, it’s worth considering fleece lined footwear which will provide a good level of insulation. Failing that consider a good thermal sock. Do I need insulated work boots? As with all weather boots - and getting on with the work in the wet - the cold can be just as uncomfortable. It pays to be prepared for cold snaps and by having a pair of insulated safety boots you can keep the chill at bay. Your toes will certainly thank you! When should I wear lightweight safety boots? Footwear that has toe and sole protection made from composite materials, as opposed to steel, will be the most lightweight and will offer greater flexibility that footwear containing steel won't. Equally, the type of materials used in the product, whether natural or manmade, will impact significantly the weight, as will the design of the footwear. Footwear with partly mesh uppers for example, will be lighter than footwear with solid leather uppers. Lighter weight footwear can be particularly beneficial in hot conditions or for those working indoors. In hot weather, it’s also worth checking if the product offers a good level of breathability. What is the most comfortable safety footwear? All day comfort is of paramount importance to tradespeople. To achieve the maximum comfort consider things like the quality and type of insole - some offer a lot more cushioning than others. Consider the materials; are they water resistant, are they breathable, are they flexible? Does the sole offer shock absorbing qualities? What is the weight of the product? The heavier the product, the more fatigue you will experience. These are all factors worth taking time to look into. More often than not, it will be worth investing a little extra to look after your feet. Often it’s a matter of personal taste, the conditions you’re working in or the level of personal protection you’re looking for. Whilst safety shoes offer the benefits of lighter weight, and are less bulky and hot to wear in the summer, they miss out in terms of the levels of ankle protection and stability offered by safety boots. Most tradespeople tend to have both options so that they can choose depending on the circumstances. The rigger boot gets its name from being provided as standard issue for workers on off-shore oil rigs. In the past they have been popular and a firm favourite on building sites because of the ease in which they can be slipped on and off. Today things have changed as some larger construction sites won’t allow them to be worn because of potential health and safety risks. This is because they do not provide the same level of ankle protection and stability as safety boots and, there have also been incidents of people slipping in rigger boots when using ladders. It’s worth checking with your Site Manager whether rigger boots are permitted. Despite their limitations, they can still be great options in specific circumstances. Can I get safety wellington boots? Yes - there are plenty of wellington boots with protective toe caps and mid plates. Some of these also have fleece lining to protect against the cold. Should I buy safety trainers? Again it’s a matter of taste and the conditions in which you’re working. PPE and fashion don’t always go hand in hand, but nowadays, there are lots of great-looking safety footwear to choose from. 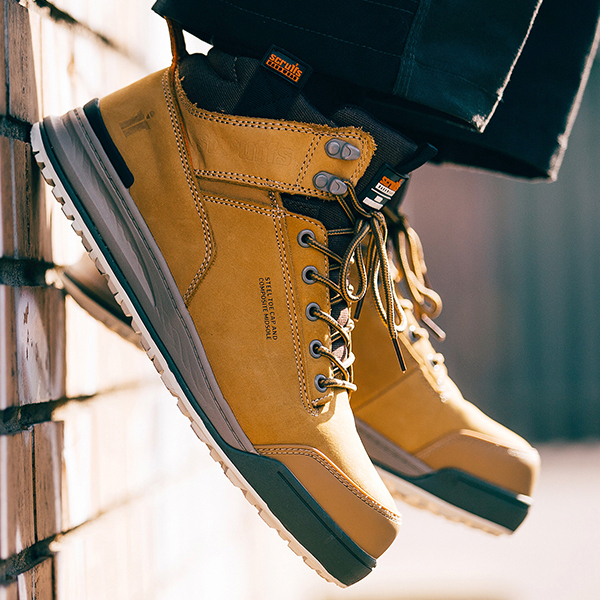 Safety trainers can look fantastic, both on and off site, and offer all the important safety benefits, as well as, the additional benefits of being lightweight and cooler to wear in the Summer. We understand everyone is different and will have their own needs and preferences. We look to provide a full range of safety footwear and PPE for all needs. Get in touch if you need to know more! Check out our article on how you can keep your tools and van safe! The Interior Oak Suffolk Satin Hinge, Handle & Latch Door Bundle is October's product of the month. Find out why here.